Admin Settings > Advanced Preferences > Email Settings> Enable Encrypted Email. In addition to Microsoft Outlook compatibility, you may also compose, receive and modify encrypted emails directly from the ShareFile web application. You can send a file stored on your account, or send a file stored on your computer. When composing your message, click Edit Message Options and click the checkbox beside Encrypt Message. Once you have composed your message, click Send. The message will pause while it is encrypted. Please do not navigate away from this page until you receive confirmation that your message was sent successfully. 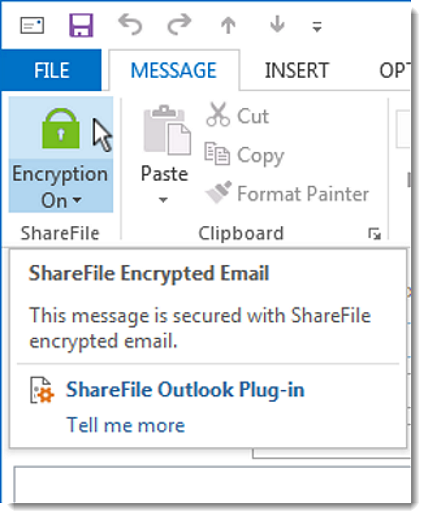 To encrypt an email message using the ShareFile Outlook Plugin, compose a new Outlook Email as you normally would. Next, if you wish, you may attach any files to send to your recipients. Attach files by clicking the ShareFile Attach Files button in the ribbon, or you may attach files normally. Files attached normally will still be encrypted when they are automatically converted to ShareFile attachments. If you have attached your files using ShareFile Attach Files, the files will be displayed in the normal ShareFile banner. Files attached “normally” are converted on send. Your recipient will see the ShareFile banner, but you will not. Now you may Encrypt your message. To do so, click the Encrypt Email button in the ribbon as shown below. An encrypted email is denoted by a closed Lock icon. You may click Encrypt Email at any point when composing your email message. Please ensure that your Lock icon is closed prior to sending the email message. You can also verify that your message will be encrypted upon sending by a change to the Send button. It will now read Send Secure. Now that your email has been encrypted, click the Send Secure button. The email message will pause in the Outbox while the attachments are uploaded and the message is encrypted. Do not force the message to send from the Outbox, as this can create an error for your recipient. To change the settings of your Encrypted Email feature, click the Plug-In Options button of your Outlook banner and navigate to the Encrypted Email tab. Require Name and Email Address requires that your recipient must enter their information before accessing the encrypted email. Require Recipients to Log in requires that your recipient log in with their ShareFile credentials prior to viewing the encrypted email. One of the above options is required when sending an encrypted email. You can choose to be notified when the encrypted email is viewed by your recipient with the appropriate checkbox. Use the dropdown menu to customize how long your encrypted email (and attached files) will be available to your recipient. When making changes to your settings, please remember to click Apply, then OK when you are finished. 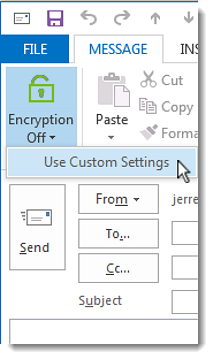 You can customize these settings for an individual email by clicking the dropdown menu beside Encrypt Email in your Outlook ribbon, and selecting Use Custom Settings. Once you have customized your settings, click OK. The current email will be encrypted using the settings you chose. These settings will apply to the current Encrypted Email only. If you have chosen to be notified when your encrypted email has been viewed by your recipient, you will receive an automated email notification once it has been read. How Do I Know My Email Was Encrypted? You can view your encrypted email in the Sent Messages folder of Microsoft Outlook. 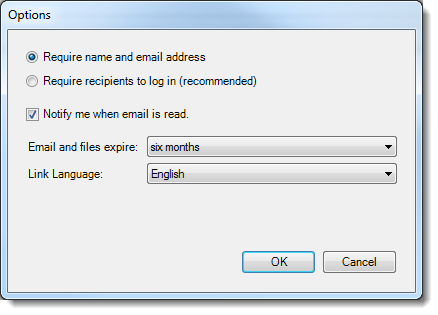 An encrypted email sent by ShareFile is denoted by a ShareFile and Lock icon beside the timestamp, as shown below. Conversely, a recipient will see the above indicators when receiving an Encrypted Email, but without the Revoke Access button. The indicators described above will only appear to Microsoft Outlook users both sending and receiving Encrypted Email messages. 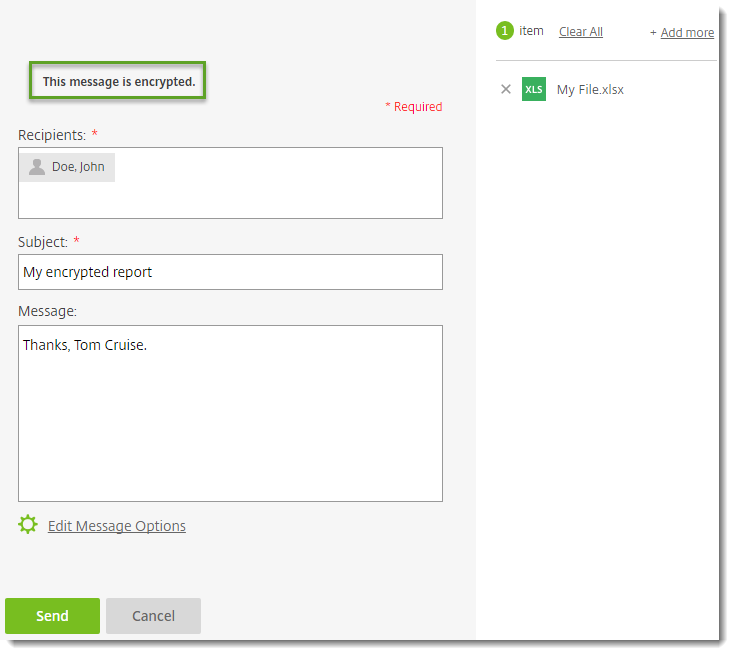 You can compose an Encrypted message from the ShareFile web app Inbox. When Encrypted Email is enabled on your account, any message created using the Compose button will automatically be encrypted. The message will pause while it is encrypted. Please do not navigate away from this page until you receive confirmation that your message was sent successfully. 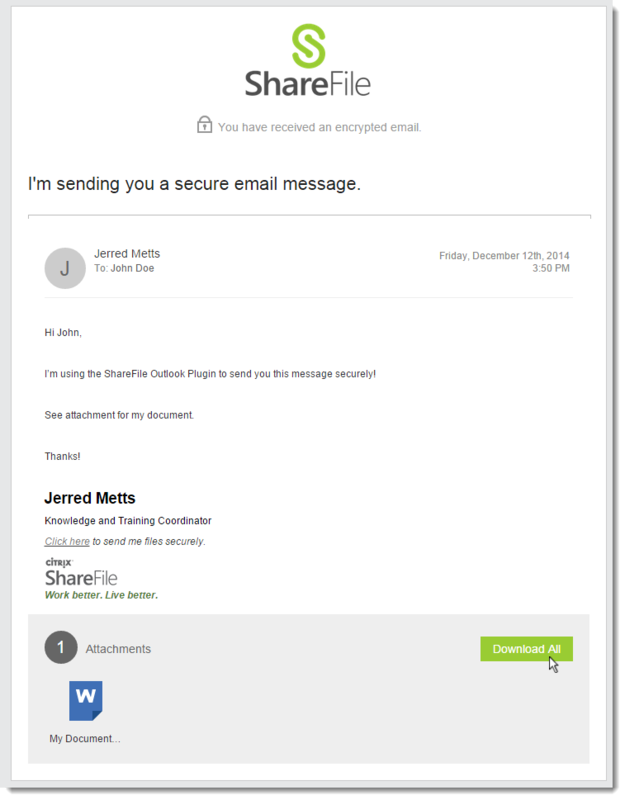 You can set your Print to ShareFile upload as an Encrypted share message. Click here for info on using Print to ShareFile. You can view encrypted emails you have sent from the Sent Messages section of your Inbox. Encrypted Emails are denoted in your Sent Messages by the presence of the Lock icon to the right of the email Expiration column. To view the message, click on its Subject line. 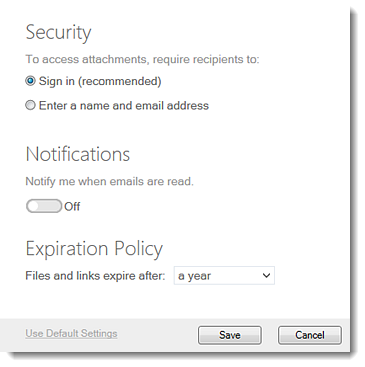 To Expire a Link or Edit Message Options, click the checkbox to the left of the email and select the appropriate option. When the recipient receives an email that has been encrypted via the ShareFile plugin, the message will be contained in a secure banner that includes a link to the encrypted message, as shown below. If you were sent an Encrypted Email from a sender that is also a user on your ShareFile account (i.e., your Subdomains are the same), the message will automatically be decrypted when viewed in Microsoft Outlook, assuming you have the latest version of the Outlook plugin. To view the email, click the View Encrypted Message button. If the sender required that you submit your name and email before accessing the encrypted email, or required that you log in to your ShareFile account, you must do so now. The secure message will be displayed in the recipients default browser, where he or she can view the contents of the email message, download attachments and respond. You can see an example below. Use the fields at the bottom of the message to send an encrypted reply. You can also attach files to your response, as shown below. Enter your message and attachments and click the Send button. If you attached files, they will be uploaded prior to sending. Please do not close your browser during the upload process. The original sender will receive your response as an Encrypted Email message. To revoke a recipient’s access to your Encrypted Email message, navigate to the Sent Messages folder of Microsoft Outlook. Click the Revoke Access option in the top right corner of your message. You must confirm the revoke action. Your recipient will no longer be able to access the encrypted email, including any message content or file attachments. You may also revoke access from the Sent Messages section of the ShareFile web app. Currently, the account-wide File Retention Policy also applies to Encrypted Email messages and attachments. If your account currently utilizes a file retention policy, that setting will override the Encrypted Email expiration setting chosen when creating your encrypted message. In order to retain access to messages and their attachments indefinitely, please update the retention policy of your Personal Folders directory accordingly. Note: Updating the account-wide retention policy is not retroactive – current users on the account must update their own policy.